Maya S. (Class of 2024) participated in the Rose Debate Public Speaking Tournament in November. 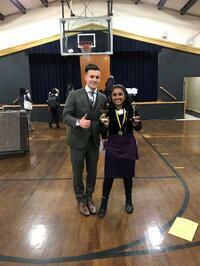 97 Participants from 20 schools came ready to compete, and Maya won 1st Place in the Stand-Up Comedy Division, 2nd Place in the Monologue Division, and 5th Place in the Impromptu Division. A group of our Bobcats attended the Central Valley Championship in Fresno on December 15. Anish S. ( Class of 2024), Roshan A. (Class of 2024) and Darshan B. ( Class of 2024) of the Mindbuilders Team, won the Robot Performance Award as well as the 2nd Place Champions Award. 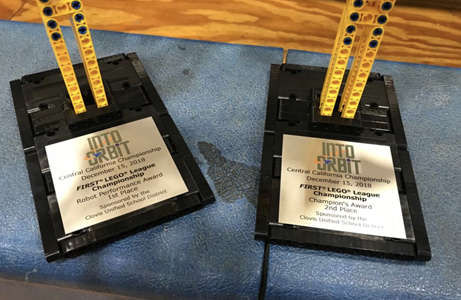 Based on the team's performance, they will participate in the FLL Arkansas Invitational in May. Be on the lookout for more updates on our Bobcats in the coming months!